Hemlock trees come in dozens of varieties. They can grow in a variety of climates, and are popular yard and landscaping trees because they are evergreens and have an appealing pyramidal shape. 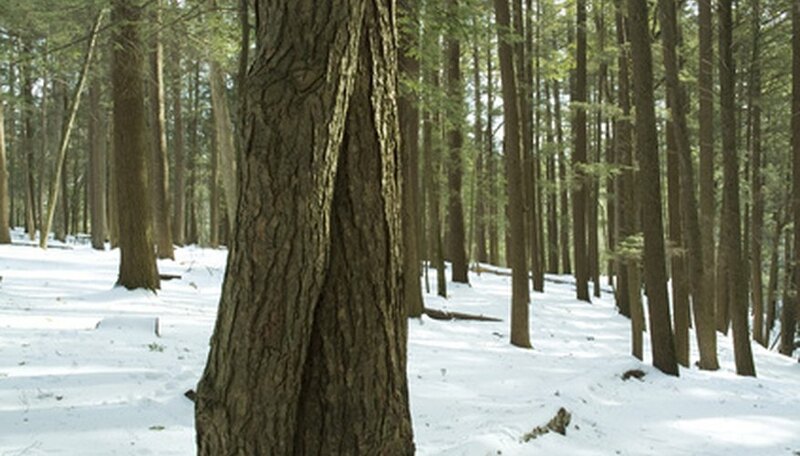 However, just because hemlocks are hardy does not mean that they are invincible. Hemlock diseases, while fairly few and far between, will bring this tree to its knees if you are not able to protect your tree and prevent the infection. There are several types of hemlock diseases and pests. Woolly adelgid--a small, aphid-like insect that lays its eggs in and feeds on hemlock twig tissue--is a particularly prevalent problem in eastern and Carolina hemlocks. Hemlocks also get needle blight and root rot. Hemlocks that are already infected with a hemlock tree disease or infested with woolly adelgid may display lumps on their branches or woolly, gray spheres clumped on the branches. Their needles may turn brown and fall. They may also shed their needles or the needles may curl and turn brown. If your hemlock tree has woolly spheres or brown lumps that appear to be slightly below the surface of the twigs or branches, then the tree is infested by the hemlock woolly adelgid. If the needles are brown and falling off, then the tree likely has needle blight. Curling needles that are brown indicate that the roots are rotting and the tree is not getting enough water. While forestry divisions all over the country are searching for biological controls for woolly adelgid, imported biological predators are currently not an entirely viable option. Generally this problematic infection is treated with insecticides and other chemical controls, which are feasible when the hemlock tree is isolated, but not in forests. Root rot generally requires the removal of the tree since, by the time symptoms manifest, the roots are already ruined. Needle blight can be alleviated and even eradicated by pruning the affected areas of the tree with sterile pruning shears and throwing the infected pieces in a garbage bag so that they do not spread to other parts of the tree or other trees in your yard. The best way to deal with hemlock diseases is to prevent them entirely. Never purchase or transplant a hemlock tree from any area where hemlock woolly adelgids have ever been reported; while their fully grown nodules are easy to spot when they are large and puffy, they are smaller than grains of pepper through the rest of their lifespan. Water your hemlocks in the morning and only when they need water. Avoid watering multiple times a day, or giving the tree only a little water at a time. Also, do not salt the concrete or asphalt near the hemlocks to melt ice if you can avoid it, since this can contribute to needle blight.